In 2004 Karen McCann, now 63, and her husband Rich, 71, embarked on a year-long adventure in southern Spain. The newly retired couple had always loved the idea of living overseas, so they decided to try it for a year, making a home for themselves in sunny Seville. “We got here, and it was like, ‘Oh my God, we really like this,’” says Karen. “It’s so much like California—the weather, the Spanish speakers, the palm trees. We were comfortable with the whole atmosphere. So the couple sold their large Ohio home, cleared out 20 years’ worth of possessions, and planted themselves permanently on Spanish soil. 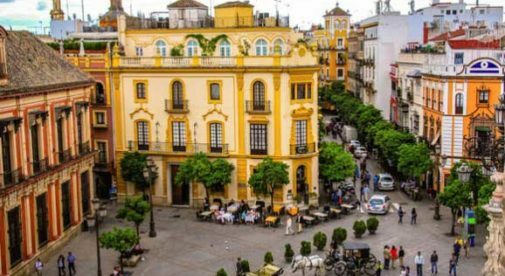 Lying at the heart of sunny Andalucia, Seville is one of southern Spain’s most beautiful cities. Waves of conquerors, from the Romans to the Moors, have left their stamp on its spectacular architecture. Thousands of tapas bars line the streets, and the warm Spanish sun nurtures parks full of palm trees. It’s known for its mild winter weather (temperatures never drop to freezing, while summers rarely dip below the mid-80s F). When asked why she loves Seville, Karen raves about the vibrant and affordable social scene, as well as the great food. “I think the first thing that struck me was the vibrancy of street life here”, says Karen. “Everybody dines out. Tapas, drinks…there are allegedly 3,000 little bars in the city. People here take their social lives as seriously as Americans take their business lives. Beer and tapas aren’t the only things that are affordable in southern Spain, according to Karen. Housing—particularly for renters—is a good deal. And the overall cost of living is comparable or less than their costs in the States. “Overall,” Karen says, “our cost of living is about the same as Cleveland. We spend more on travel and a lot less on food, going out, and entertainment. We don’t have a car here, so we save on that, because in Seville we can walk everywhere… And our rental is a fabulous deal. We pay far less than we’d pay in any city in the U.S.
Another great deal, according to Karen, is private health insurance. And not only is it affordable, but the quality is good, especially for primary and secondary care. The couple’s private insurance, through Sanitas, a subsidiary of the global provider Bupa, costs them around $530 a quarter. They’ve selected outpatient coverage only, which includes house calls and private clinics. The couple also loves Seville’s relaxed pace of life. An average day includes time for writing, photography, morning yoga or Pilates classes, siestas, shopping, meeting friends for coffee, tapas in the plaza near their house, and exploring Seville’s charming neighborhoods. Looking back, Karen says the move has changed her in a profound way, and worked wonders for the couple’s retirement. Learn more about Spain and other countries in our free daily postcard e-letter. Simply enter your email address below and we’ll also send you a FREE REPORT — Live the Good Life in Sunny, Affordable Spain. This special guide covers real estate, retirement and more in Spain and is yours free when you sign up for our IL postcards below.